Update: Entries are now closed, the winner will be announced soon! Well, one of you anyway! 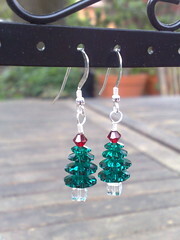 1 pair of Christmas tree earrings in either green or clear crystal (your choice) – as per my first post about this giveaway. 1 pair of Snowman earrings – this is the first pair of these that I’ve made, I’ll be doing some more tonight and they’ll be going into my shop over the weekend. on gold plated surgical steel earhooks. 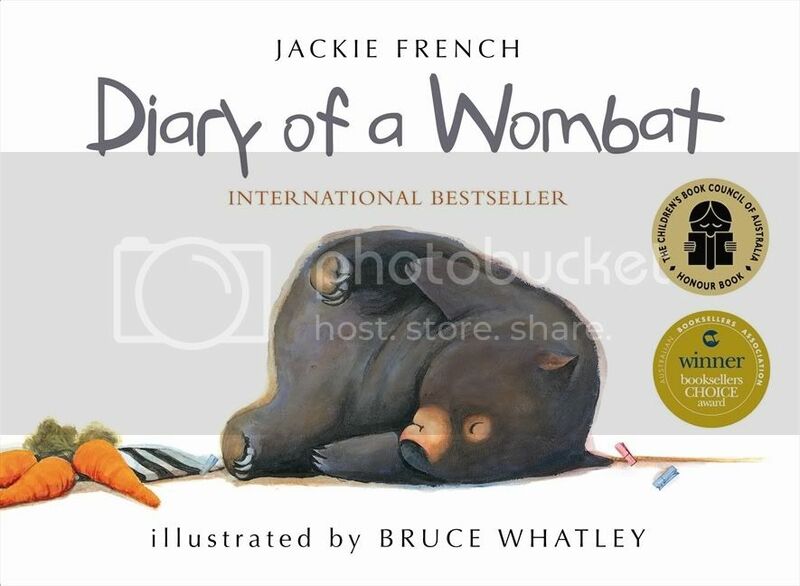 1 copy of the board book edition of Diary of a Wombat – about which I raved yesterday. 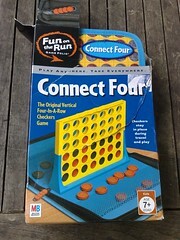 1 travel friendly Connect Four game – outer packaging slightly battered but game never used, I bought it for a nephew one year and then found out he’d already been given the same game by his parents. Great minds think alike? 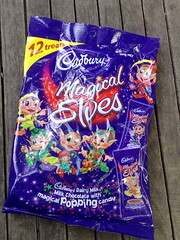 1 bag of Cadbury Magical Elves – milk chocolate with popping candy, just because they’re awesome. 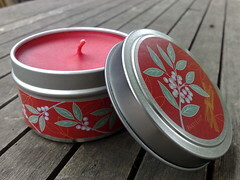 1 Cinnamon and Bayberry scented candle in a tin – my freebie for hosting a Partylite demonstration last month, I won’t use it ’cause candles in tins aren’t my thing but I LOVE the scent, I’ve got pillar candles to enjoy it by. Now the important bit, what do you have to do to enter? That’s it, one entry per person but feel free to comment more often if the conversation demands it, and make sure I can contact you either by having an email in your blogger profile or a link back to your blog for me to follow. No extra entries for following or linking because that’s not what this is about, though you’re very welcome to pop a link up on your own blog, Facebook or Twitter and let others know what’s on offer. hmm, not sure if being first is actually a good thing. The earrings would be MINE< ALL MINE! the book: looks gorgeous, and I'd love to start a collection for our future munchkins, as we're both such big readers we fully intend for our kiddies to be! the chocolate? I would EATS IT with the help of my Phil. OOH I love pressies! I would keep the pretty earrings and candle for me. I might share the choccies with Shane if he is good and keep the travel game for games night. I would love to read the book to Annie… I know the story, love it, but it hasn't yet made it into our collection! I would give away the earrings and candle as Christmas gifts, give Diary of a Wombat to my charming mother for her teachery pursuits, play with the Connect Four because it's a great game, and eat the chocolate without sharing. Also! Also! If I won? You would not have to mail it as I would swoop, swoop I say, in to claim it. You know you want to pick my name out of the hat. If I got any of it, I would be part of the spirit of giving and pass them onto a friend who has seen better times for herself and her very young daughter. While we aren't financially well off, there are others who have it worse. It is about sharing the love. Please put my name down for green tree earrings and snow man earrings (for to purchase)! I would give away the earrings as pressies (since I'm going to buy my own anyway). I'd give Diary of a Wombat to the new little person currently turning from blob to baby. The game would probably become a stocking filler. The candle would be kept in line to replace the Enjo one by the front door when it runs out. What a lovely giveaway! I would keep one pair of earrings and give the other pair to one of my daughters. The Connect 4 game would be played by my youngest 2 kids in the car, we seem to spend half of our life in that car! They would enjoy the book, too. The candy? Hmm, maybe the kids would get it, maybe Mama would get it. 😉 And the candle would, of course, be enjoyed by ME! 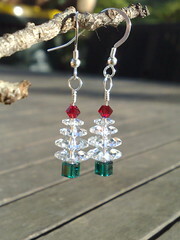 Xmas earrings! Well I would wear them! I love Xmas earrings. And Darren and I almost bought a Connect Four last week for when we're away (we bought Yahtzee for the same reason – we like the simple games). I definitely would give Diary of a Wombat to the big kid in my house who's wombat crazy. Choccies would get eaten I'm sure, while I have to admit I'd probably re-gift the candle – I'm not one for strong scents and it seems to be worse lately. So sign me up for the goodie train! I wasn't going to join but, to be honest, I can't remember where I put the Xmas tree earrings I bought from you last year….so taking a chance to win some. 🙂 Like the candles and chocolate, too. Kids are a bit old for picture books (though you'll find heaps in a high school library nowadays – visual literacy and all that) so may give this one away. That said, I haven't read this book so maybe keep? sounding a bit selfish here so maybe give the Connect 4 as a pressie? I love the earrings. I might have to give a pair to GJ. The book I would give to my sister, to get her to start a collection of great Aussie books. The Connect Four I would also give to her. The chocolate would be devoured by Nick and GJ. And I can almost smell that candle from here! I would really love that candle. What a great collection of goodies! Me me me me! Put me in da competishuns please! 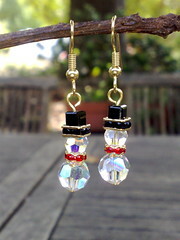 I would keep all the earrings for myself, cos they make me go squee! I have a friend with a little daughter that I'd give the book to (how cute is that artwork?) Connect Four would go to my office for stress relief over the lunch table. As would the choccies. And the candle would go in my living room window to light over Christmas, to remember all of the friends I can't be with, and those I've lost at a time of year when I miss them the most. Oooh I'd love the green tree earrings, which I will buy if I don't win. I might keep the snowman ones or give them as a gift, depends on the kids opinions. (Sometimes they just luv me wearing something). The kids will get the book and the game. Book for the little one and game for the eldest. The candle will go nicely on the t.v unit with my other christmassy bits and pieces. You're very kind to be doing this. What a great gift package! Something for everyone! Gosh you're a sweetie and smart too! see how many commentses u got! how silly of them, don't they know that all prizes are mine. Share them with my family on Game Night at our house! 3) Cadbury Magical Elves: I'd share them at work – or maybe not! Entries are now closed – will be posting the winner soon!